Now that the end of the year is upon us the studios have been releasing to theaters all of their award worthy films and campaigning for Oscar nominations. One film getting some Oscar buzz is Alexander Payne's Nebraska, which stars Bruce Dern, one of Hollywood's most underappreciated actors. Paramount is pushing for Dern to be nominated for Best Actor, who if nominated and wins, would earn his very first Academy Award. 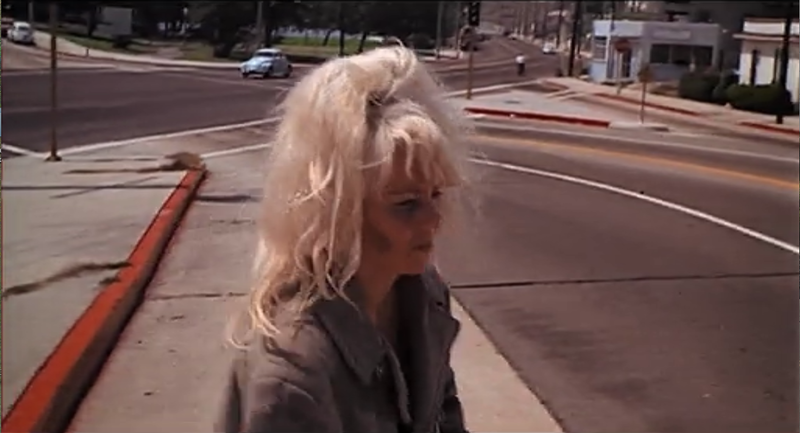 Dern has had some compelling roles in many significant films including They Shoot Horses, Don't They? 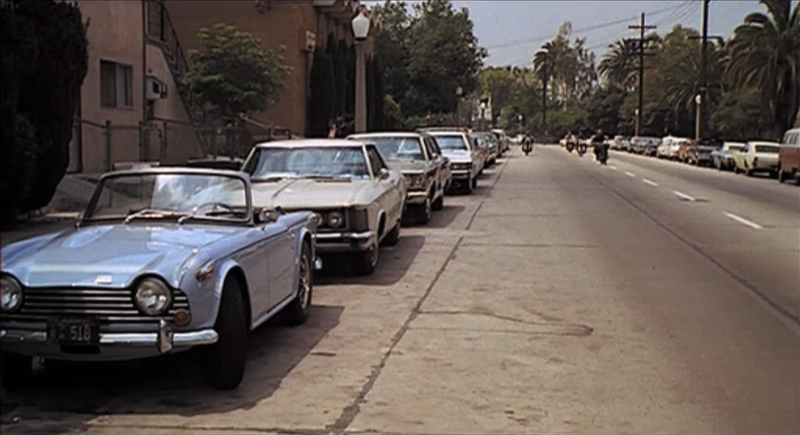 (1969), The King of Marvin Gardens (1972), and The Great Gatsby (1972). He was nominated for a Best Supporting Actor performance in Coming Home (1978) but lost to Christopher Walken in The Deer Hunter (1978). Come time for the Academy Awards I'll be rooting for Dern to win his first Oscar. I'd much rather see the guy get an Oscar for a distinguished performance than a lifetime achievement award (if he would even be given that). 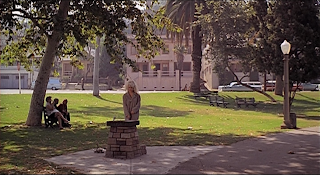 And forget prestige pictures, my favorite Dern performance is as Mark Rumsfield in Joe Dante's underrated classic, The Burbs (1989). I could watch that film over and over again without tiring, and that is award worthy enough for me (but I'm probably in the minority on this one). Like nearly every actor, in addition to some important films, Dern has also starred in some real turkeys. One of Dern's early films, The Cycle Savages (1969) is one of them. 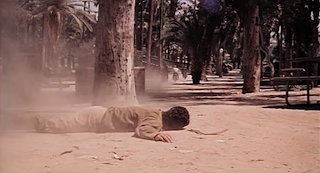 The film is so ridiculous it's entertaining. 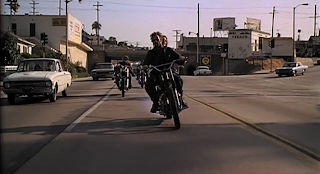 Dern is a leader of an LA biker gang who wants to cut off the hands of an artist who he catches sketching him and his girl being intimate. 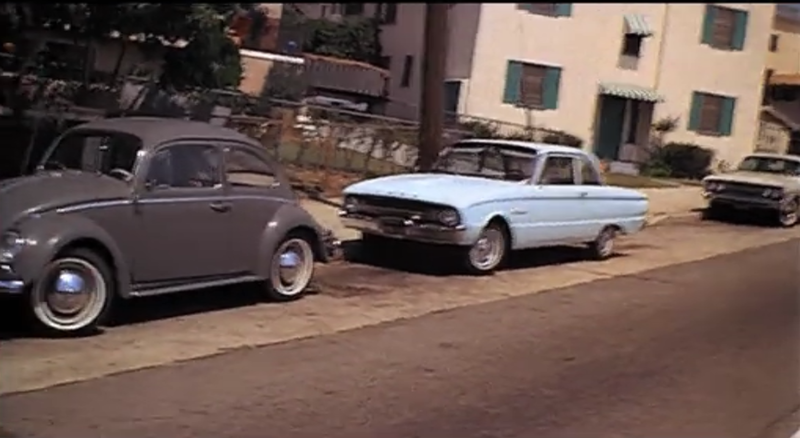 The film was shot mainly on location around the Los Angeles neighborhoods of Echo Park and Silver Lake. 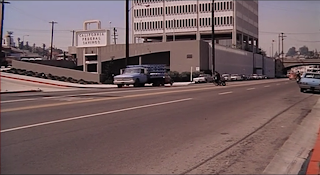 Here are many of the filming locations for this low budget flick. 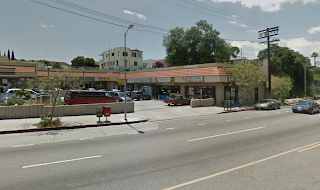 Food stand on Sunset Blvd near Rosemont Ave.
A strip mall is now located on the site of the food stand. 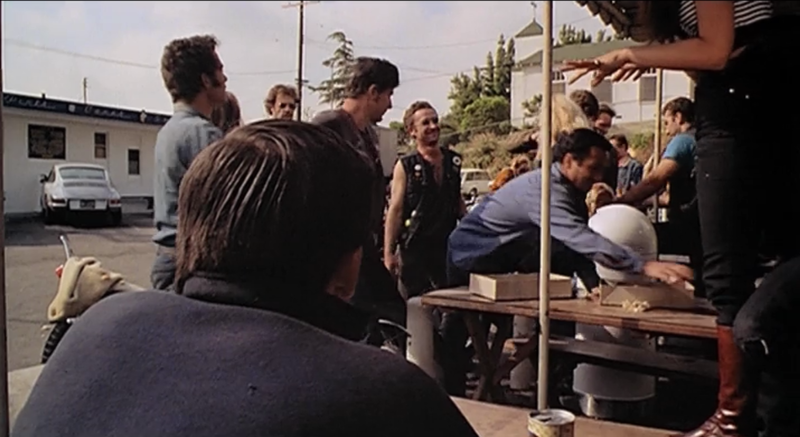 During the opening scene of the film we see the biker gang roll up to a food stand and begin harassing a couple of the patrons. 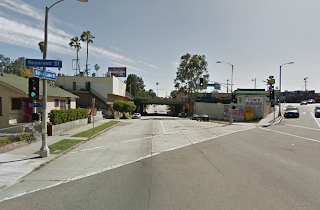 The food stand was located on Sunset Boulevard near the intersection of Rosemont Avenue. Today the food stand building is gone and on the site is a generic looking strip mall. See the comparison above. I had a hunch that this location was located on Sunset, so using Google Street View, I started scanning businesses in the Echo Park neighborhood located on Sunset. I was able to confirm the location when I identified the buildings in the comparison below located across the street from the food stand. 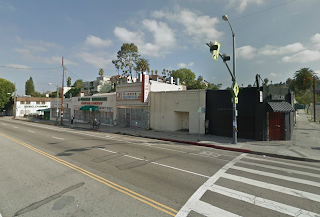 Shops at 2235 Sunset Blvd across from the food stand. The same shops and houses at 2235 Sunset Blvd. The above comparison shows the view looking across the street from the food stand site. The businesses (the address for the first business is 2235 Sunset Boulevard), and the homes just above the businesses are all still standing and recognizable. The scene below shows the seating area and parking lot for the food stand. In this view we can see a church in the background. That church, located at 1025 Rosemont Avenue can still be found just behind the strip mall parking lot. The outdoor seating at the food stand on Sunset Blvd. 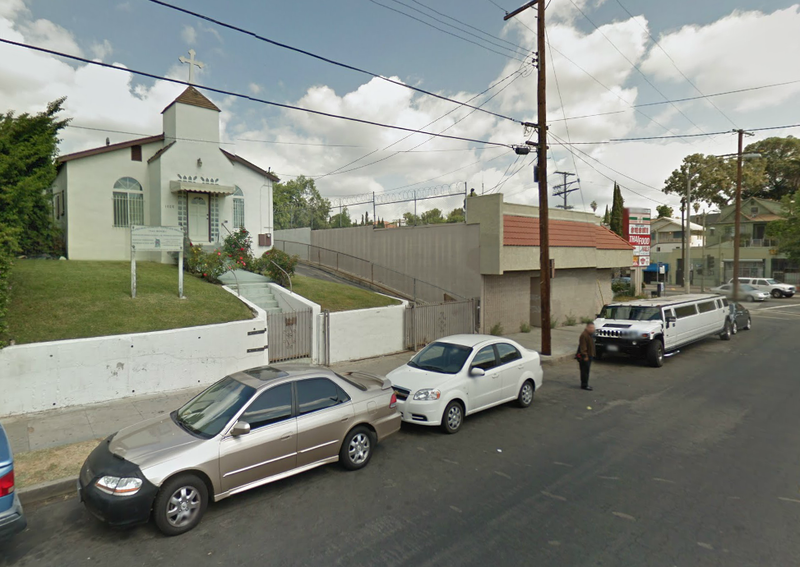 1025 Rosemont Ave. The church located behind the food stand. The scene below is a view looking from the food stand towards Rosemont Ave. 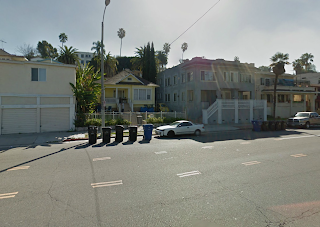 It appears there was another food stand next door but as can be seen in the Google Street View screenshot for comparison, this business has also been demolished. Looking toward the SW corner of Sunset and Rosemont. 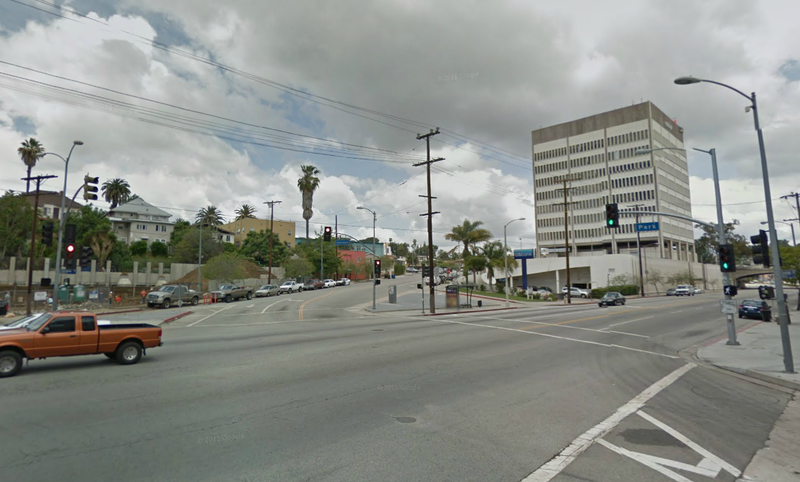 Looking toward Rosemont Ave from Sunset Blvd. 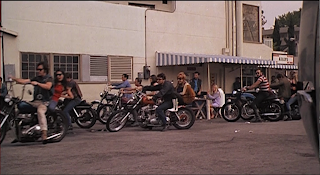 The biker gang getting ready to leave the food stand on Sunset. A generic strip mall is now located on the food stand site. 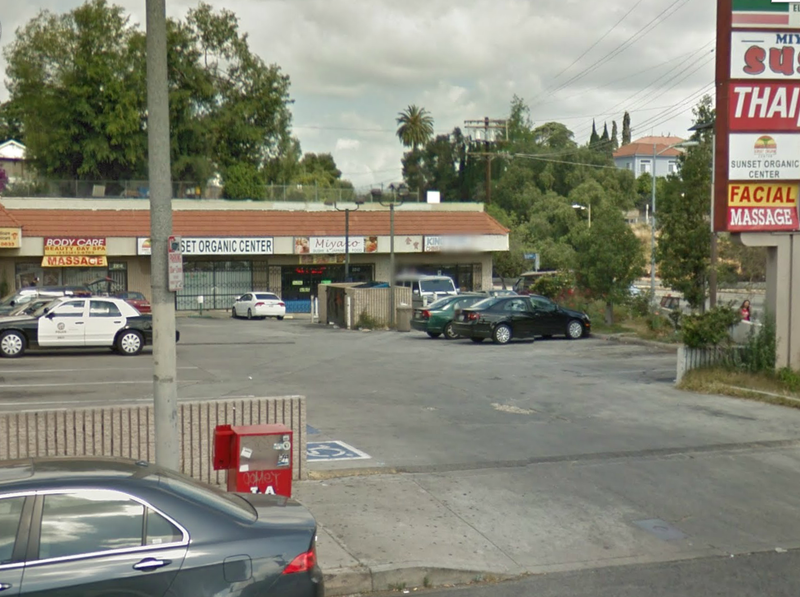 Above is a comparison showing the full view of the food stand and the strip mall that is located there today. Does anyone know what this food stand was and how long it was there? After harassing the patrons at the food stand Dern leads his gang down the streets of Echo Park and Silver Lake. Below Dern can be seen riding his bike down Silver Lake Boulevard near the intersection of Reservoir Street. 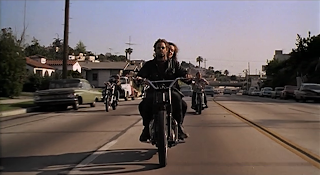 Bruce Dern leads the gang down Silver Lake Blvd near Reservoir St. 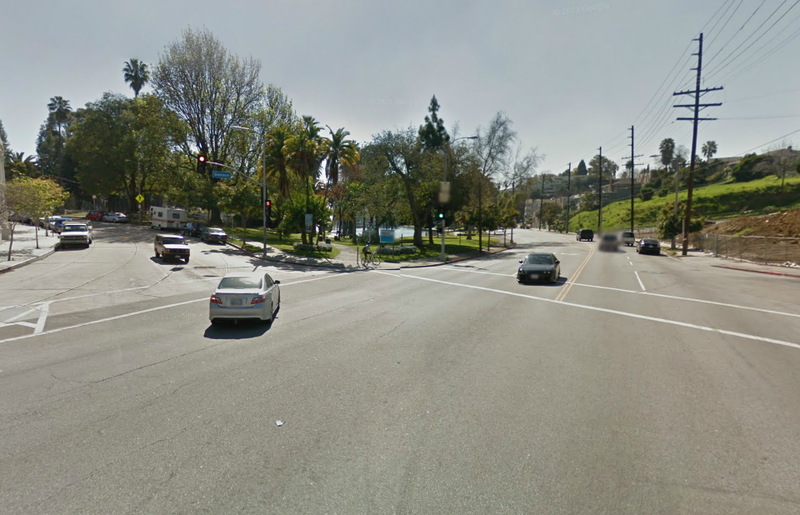 Looking down Silver Lake Blvd from Reservoir St.
Below Dern continues riding down Silver Lake Boulevard. In this shot he is passing homes located at 1332 and 1334 Silver Lake Blvd. 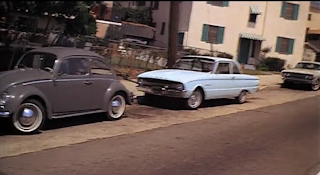 The homes, although painted new colors, look mostly the same. 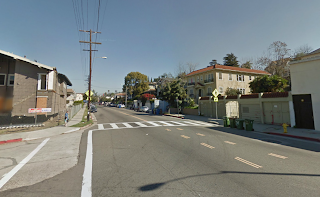 By the way, according to Zillow, that home at 1334 is a 2 bedroom, 1 bathroom place built in 1962 and has an estimated value of $783,666. It last sold in 1983 for only $29,000! 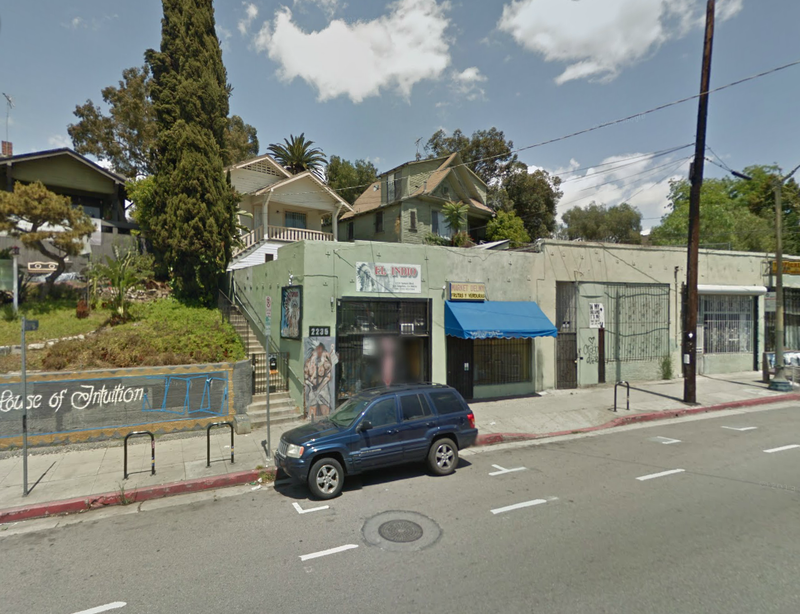 Dern and gang pass 1334 Silver Lake Blvd. 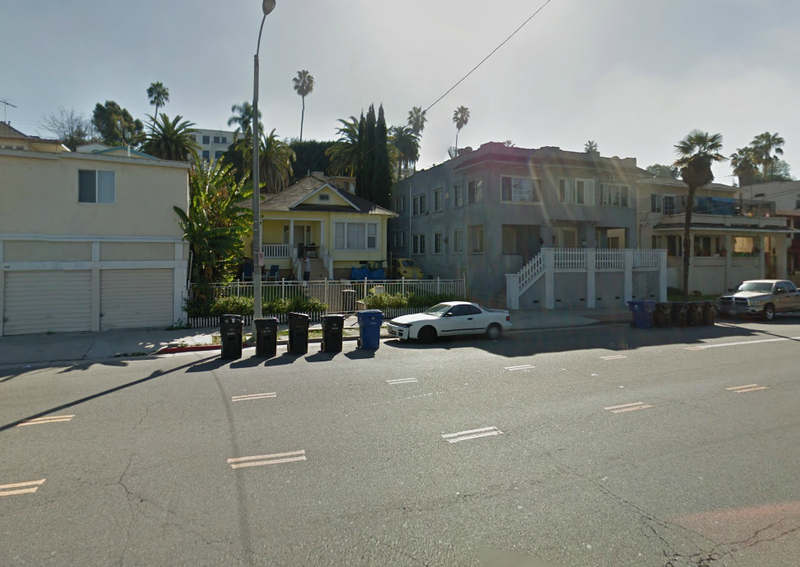 Contemporary view of the homes at 1334 and 1332 Silver Lake Blvd. One of the primary locations that appears throughout the film is an apartment building located at 1000 Echo Park Avenue, just across the street from Echo Park Lake. 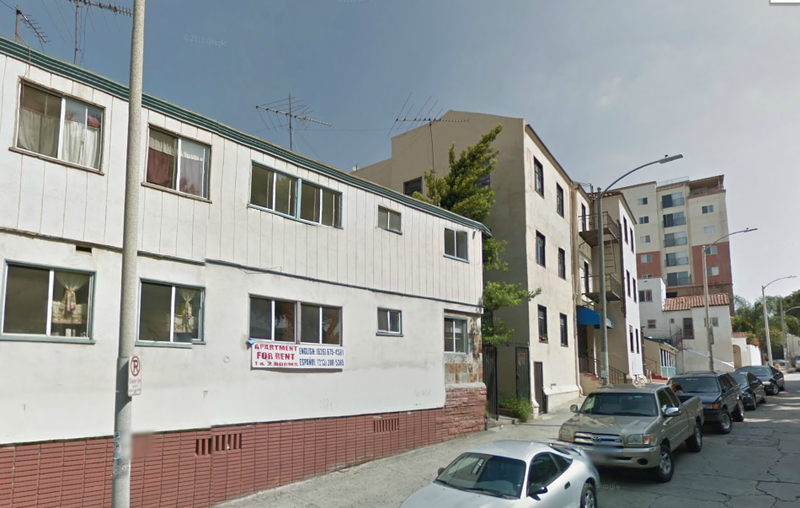 The apartment building, known as the Sir Palmer apartments, is still standing and looks little changed. 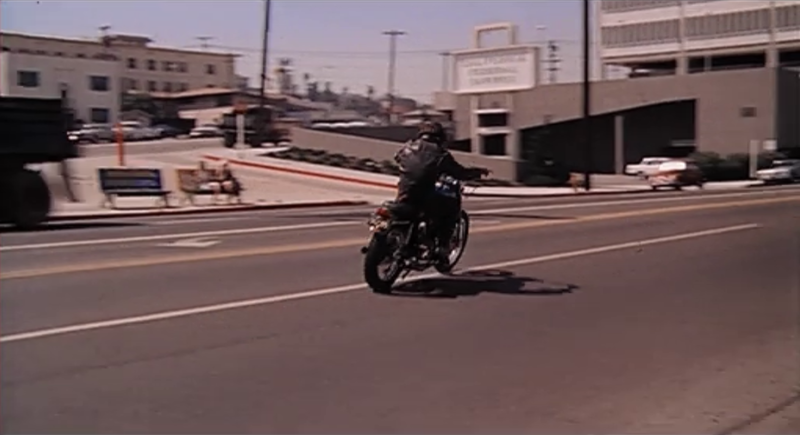 In the scene below we see the biker gang driving down Echo Park Ave and approaching the apartment building. The gang heads toward 1000 Echo Park Ave. 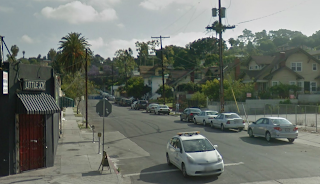 Looking down Echo Park Ave. The lake would be on the right. 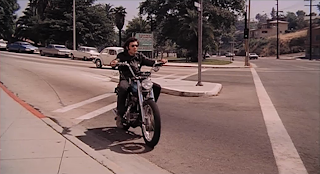 Dern on his bike in front of 1000 Echo Park Ave. 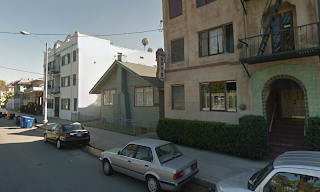 The same apartment building still stands at 1000 Echo Park Ave. 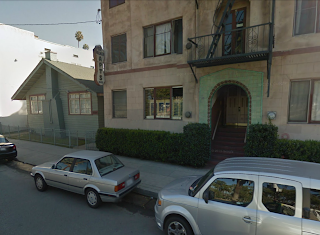 Looking north down Echo Park Ave.
Another view of the Sir Palmer apartment building. The Sir Palmer apartments at 1000 Echo Park Blvd. 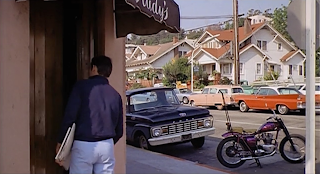 Another location that shows up more than once is a dive bar, in the film called "Rudy's" (not sure if this was the name of a real place or fictional) that was located on the corner of Sunset Boulevard and Portia Street. Today this building is the location of Little Joy Cocktail Lounge, a popular Echo Park dive bar. 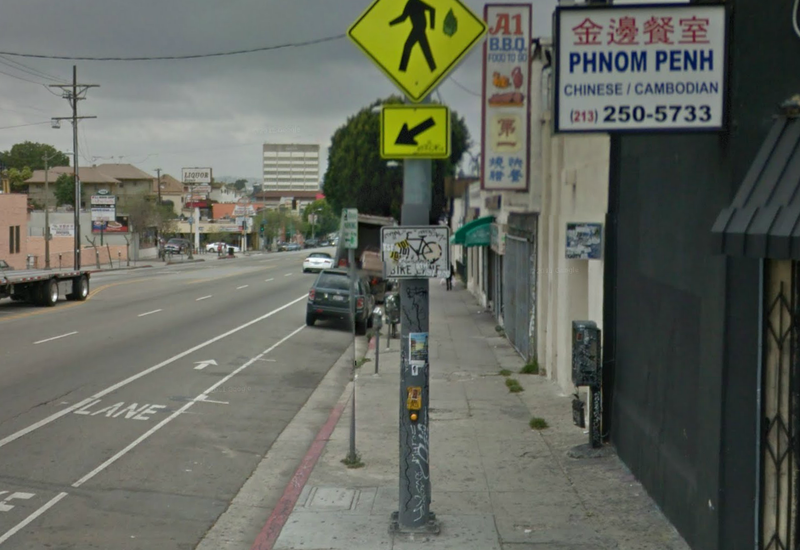 In the scene below we a see girl, who was recently raped by the biker gang, walking down Sunset Blvd toward Portia St. 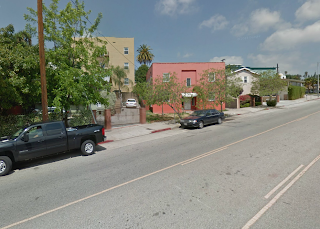 The building in the red orange brick is the side of Rudy's/Little Joy. 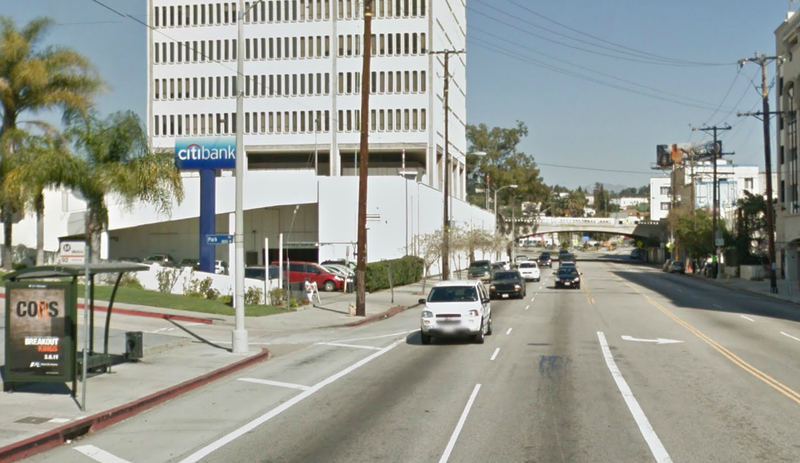 Looking down Sunset Blvd from Portia St. Looking down Sunset from Portia street. 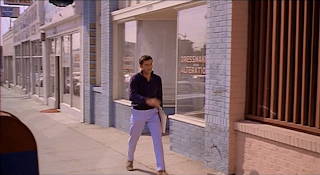 In a separate scene we see the artist (Chris Robinson) entering Rudy's. In the background we can see a couple of old homes. 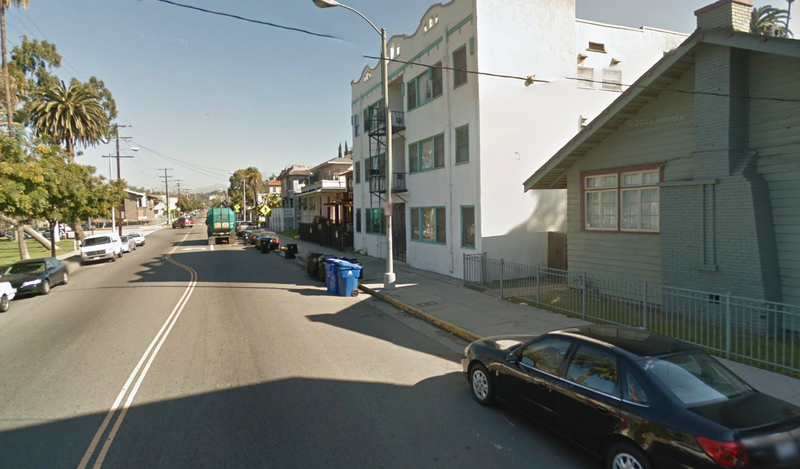 These old homes can still be seen in the background on Portia Street. Robinson enters "Rudy's" on the corner of Sunset and Portia. 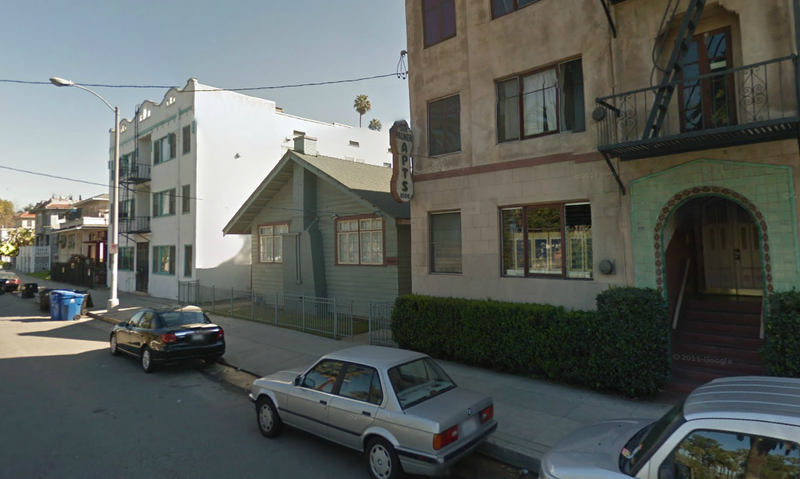 The Little Joy bar is now located at the corner of Sunset and Portia. 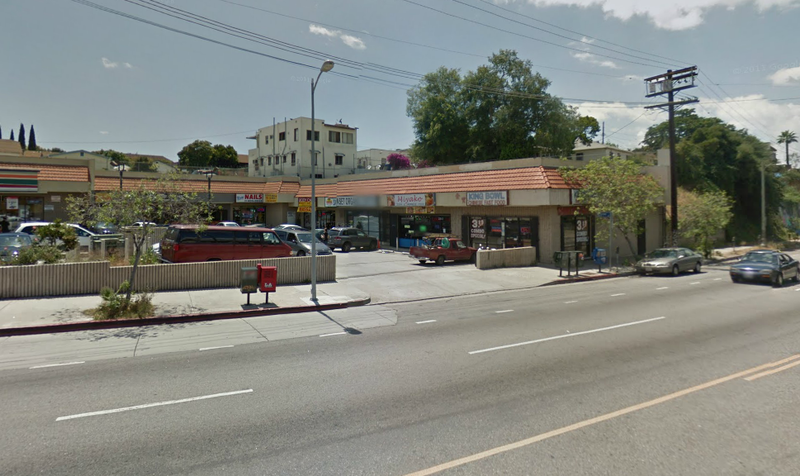 On the opposite corner from Rudy's/Little Joy there used to be a Shell Service Station. This was still a gas station until April 2012 when it was bulldozed to make room for another gas station and convenience store. A Shell Station across from Rudy's. 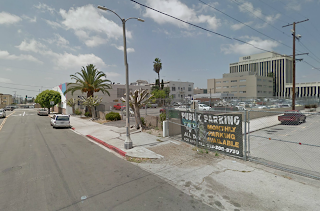 The Shell Station site is now a vacant lot (April 2012). Photo by Mary-Austin Klein. 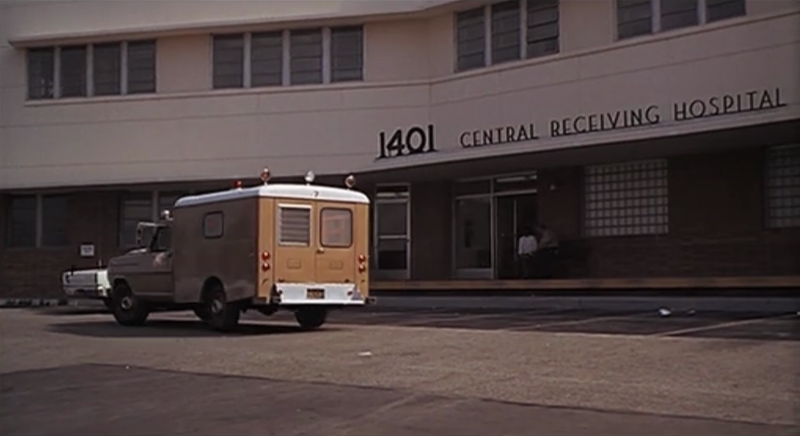 Robinson passing 1485 Sunset Boulevard. Looking towards shops at 1485 Sunset Boulevard. The black building is Little Joy. 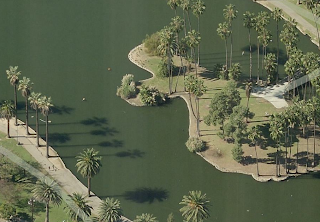 A few scenes take place at Echo Park Lake. There is an early scene of the artist watching people and sketching in the park. 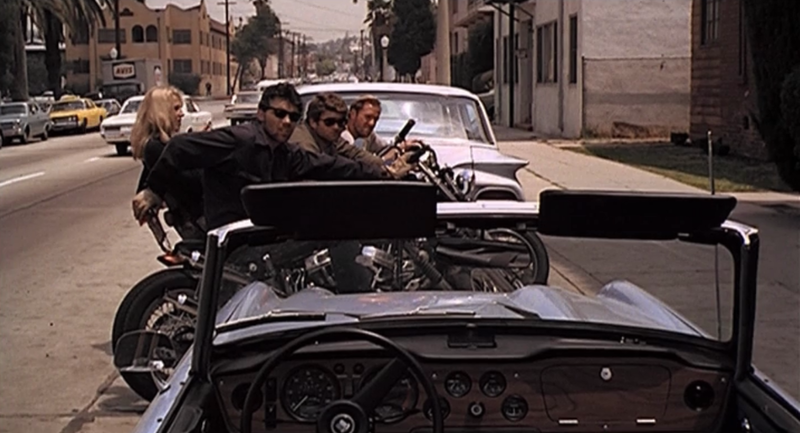 Another scene shows the biker gang beating the crap out of a guy and then taking his motorcycle. 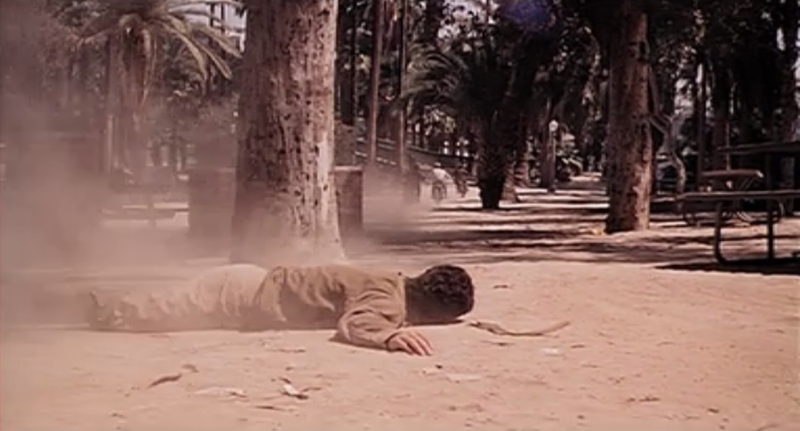 Most of the action takes place near the end of the lake where the bridge is located. 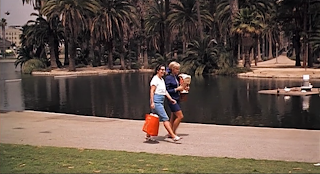 Ladies walk along Echo Park Lake. The bridge can be seen in the background. 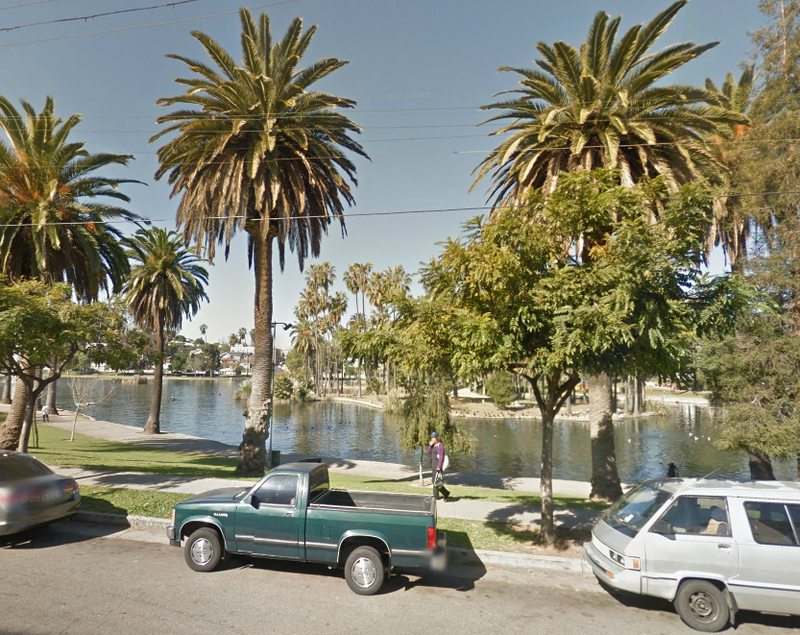 Looking at Echo Park Lake. The bridge is in the background. 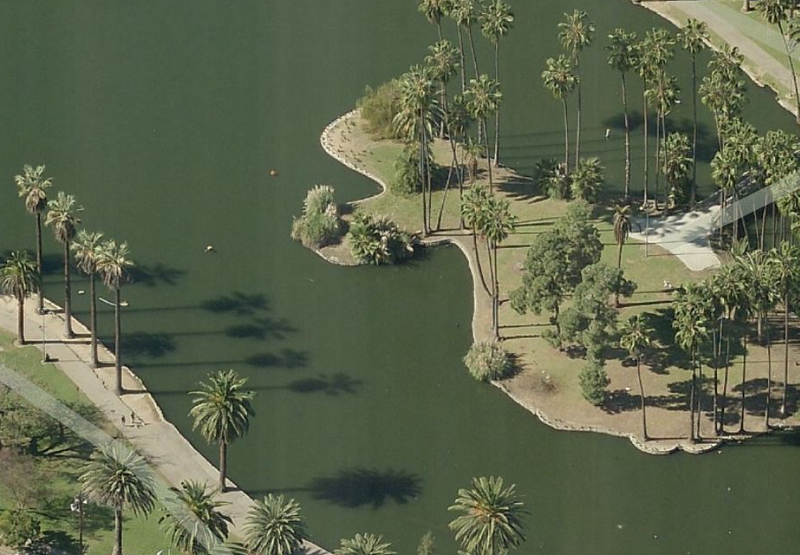 Bing Bird's Eye view of Echo Park lake and the bridge. A man gets beaten at the park near Echo Park Lake. 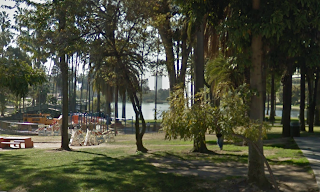 The picnic area near the bridge at Echo Park Lake. 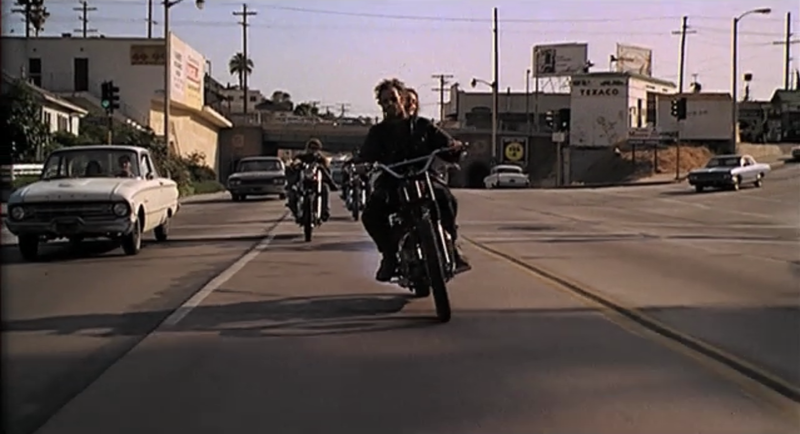 In the scene below one of the bikers in the gang rides by Echo Park Lake at the intersection of Park Avenue and Glendale Boulevard. He turns from Park Ave on to Glendale Blvd where he stops at a bus stop to flirt with some chicks eating ice cream. 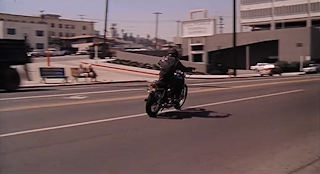 Biker on Park Ave at Glendale Blvd. Corner of Park Ave and Glendale Blvd. The biker passes the California Federal Savings on Glendale Blvd. 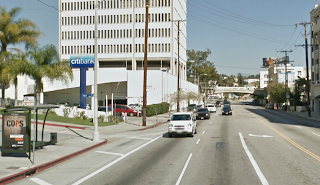 The California Federal Savings building is now a Citibank. 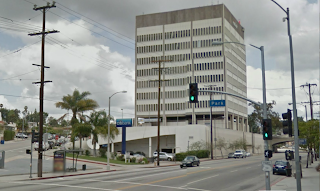 One of the landmarks we see when the biker drives down Glendale Boulevard and pulls up to the bus stop is the California Federal Savings building which is now a Citibank. 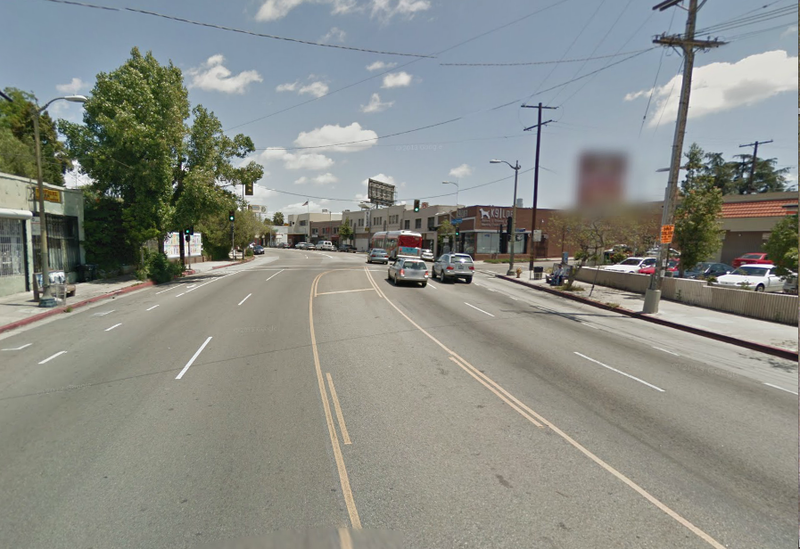 Looking north down Glendale Blvd from Park Ave. 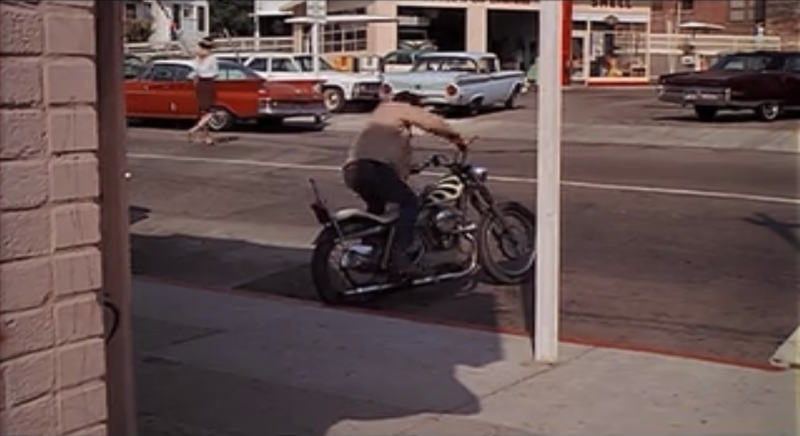 The biker approaches the girls at the bus stop located on Glendale Blvd near Park Ave. 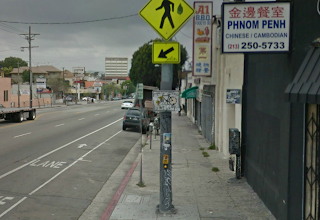 This is still a real bus stop location. In the background in the screenshot below is part of the building which is now home to the Echoplex music venue. 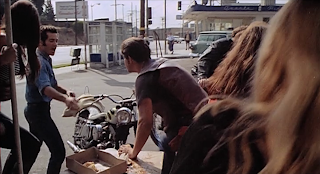 The biker picks up chicks at the bus stop at Glendale and Park. 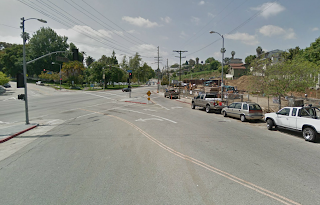 There is still a bus stop at Glendale and Park. 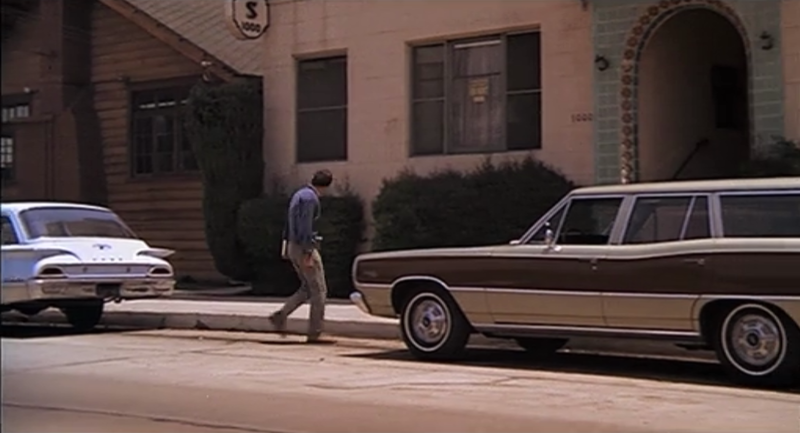 In a later scene we see the girl wander back to the bus stop location after she has been raped by the gang. We get another view of the bus stop location, this one looking down Park Avenue in the direction of Echo Park Lake. 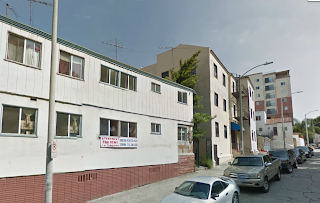 She then wanders up to an apartment building located at 1944 Park Ave before heading into the park. The girl wanders back to Glendale and Park after being raped. Looking down Park Ave towards Glendale Blvd. 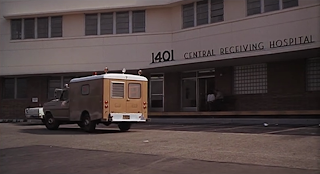 The girl wanders to 1944 Park Ave. 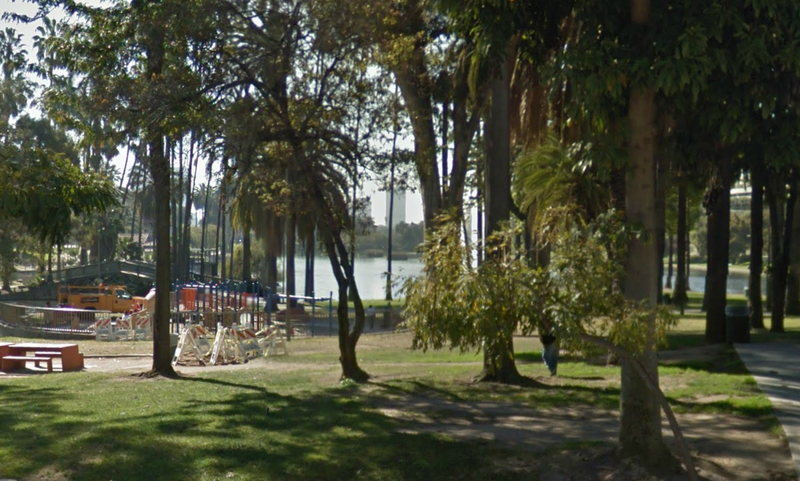 Looking towards 1944 Park Ave.
Once the girl enters the park at Echo Park Lake we get a glimpse of some apartment/housing buildings in the background. All of these buildings are still standing as can be seen in the comparisons below. 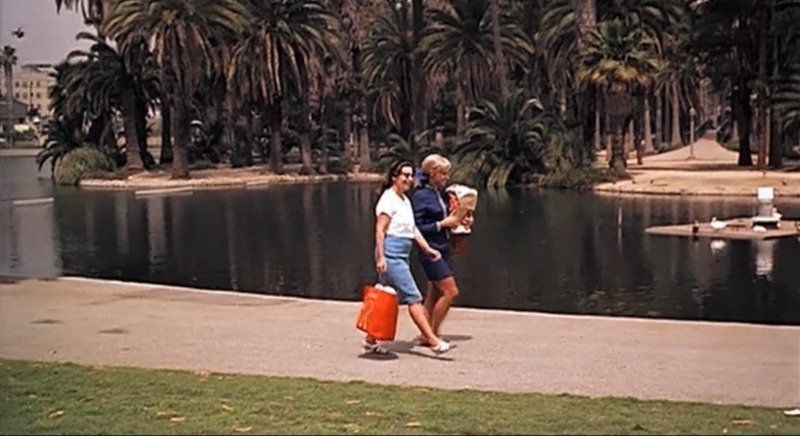 The girl heads to the park at Echo Park Lake. Apartments near 1024 Echo Park Ave.
Apartments on Echo Park Ave in background. Looking down Echo Park Ave from Park Ave. 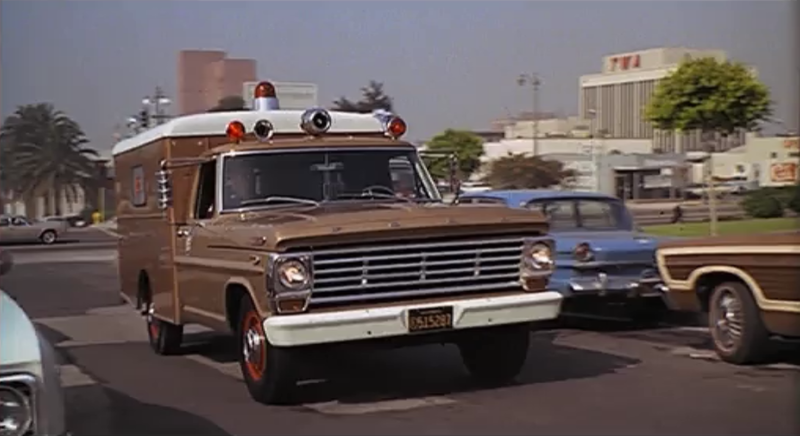 The girl passes out in the park and we then see her rushed by ambulance to the hospital. 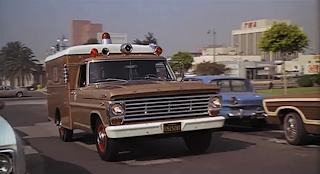 In the scene below we see the ambulance racing down Valencia Street toward Sixth Street. 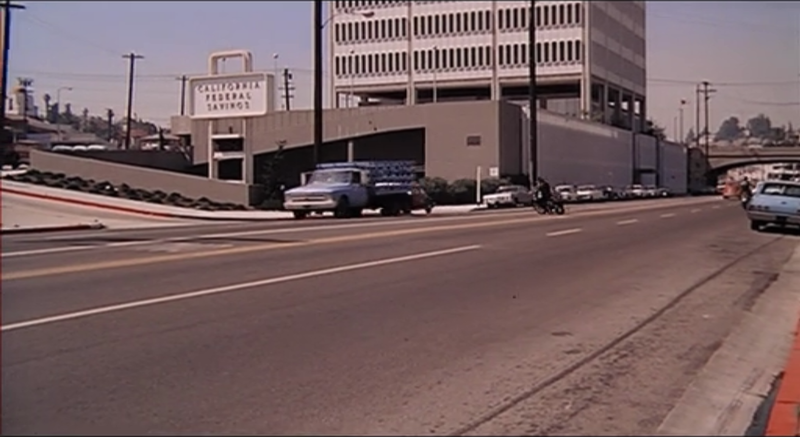 In the distance we see a TWA building. This building is still standing but is an office building with mixed businesses. Looking down Valencia St. from Sixth St. The ambulance arrives at 1401 W. Sixth Street, the site of what was then the Central Receiving Hospital. 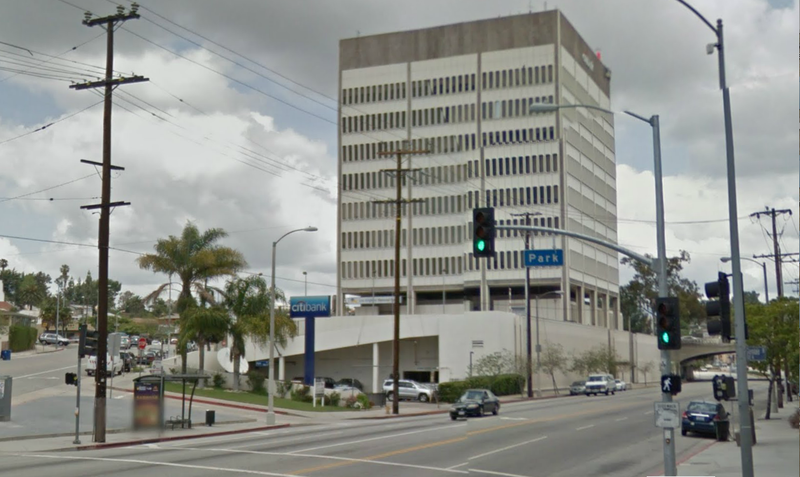 This building has since been torn down and today The Rampart Division police station is located at the site. 1401 W. Sixth St. - Now the Rampart Division police station is located on the site. 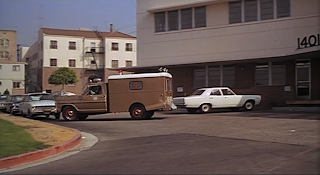 As the ambulance turns into the hospital driveway we see a couple of apartment buildings in the background. 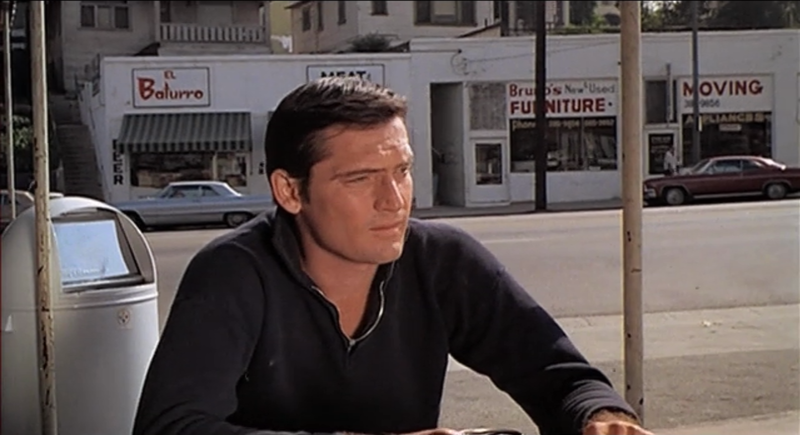 Although the hospital was torn down, these apartments seen in the background are still standing. 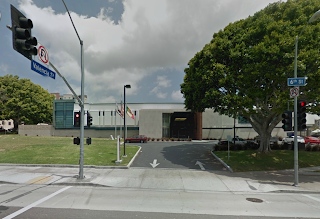 They are located on Loma Drive, just off of Sixth Street. 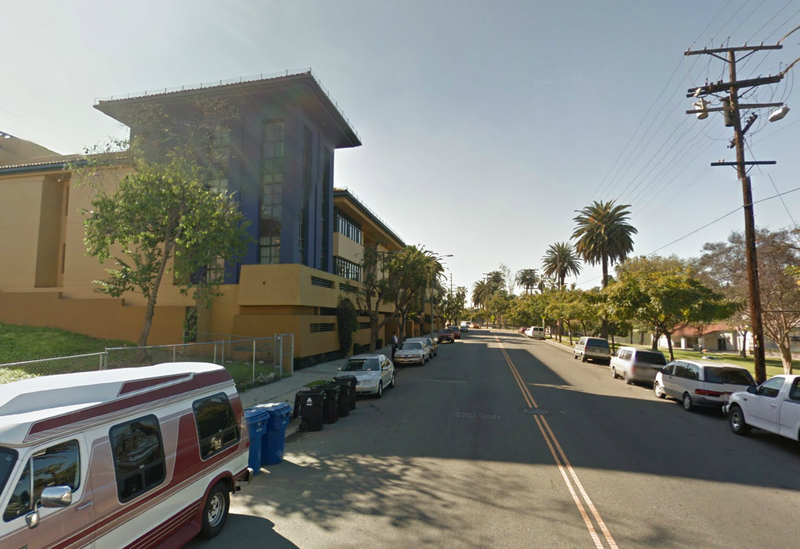 Apartments stand on Loma Dr. in the background. 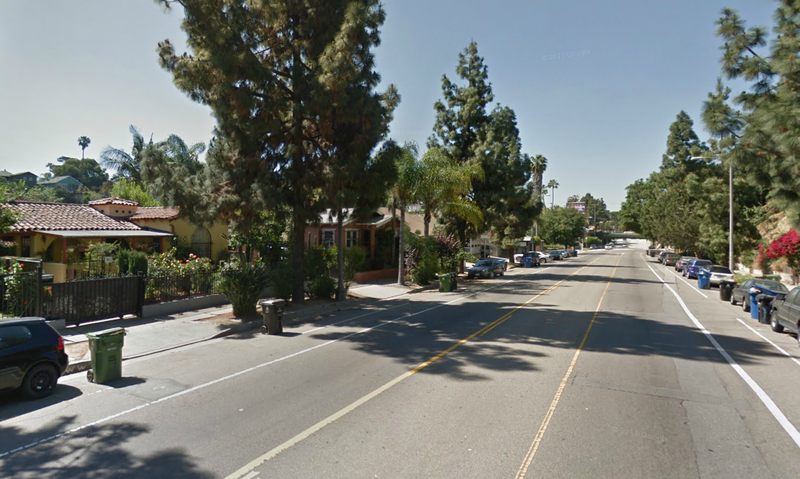 Looking down Loma Drive just off 6th Street. 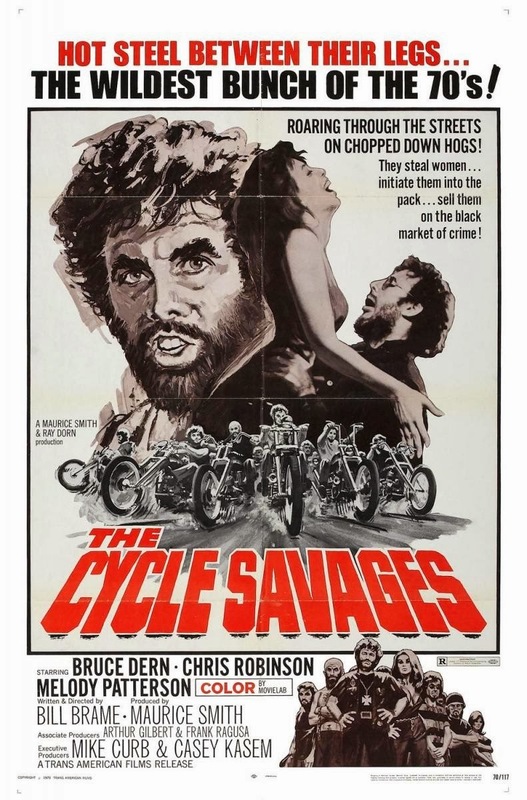 The Cycle Savages is available on DVD and is currently available for streaming on Netflix. In addition to Bruce Dern and Chris Robinson, the film also stars Melody Patterson, Maray Ayres, and Casey Kasem who was also a producer on the film.